← We have an official schedule for our Twitch channel! Anthony and I had a pretty great weekend. It was the first time since summer that we both had the full weekend off. We took advantage of it with some pampering, errands, drinks, and quality time around the house. 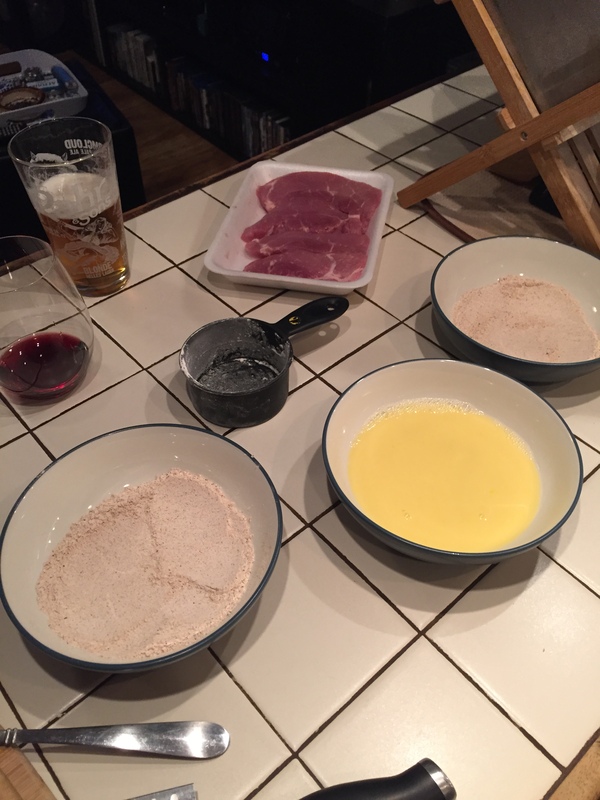 A few days back we picked up some pork and at Anthony’s request he wanted it “crispy.” We decided to pull out a recipe from our favorites to make while we finally got around to watching Chef. 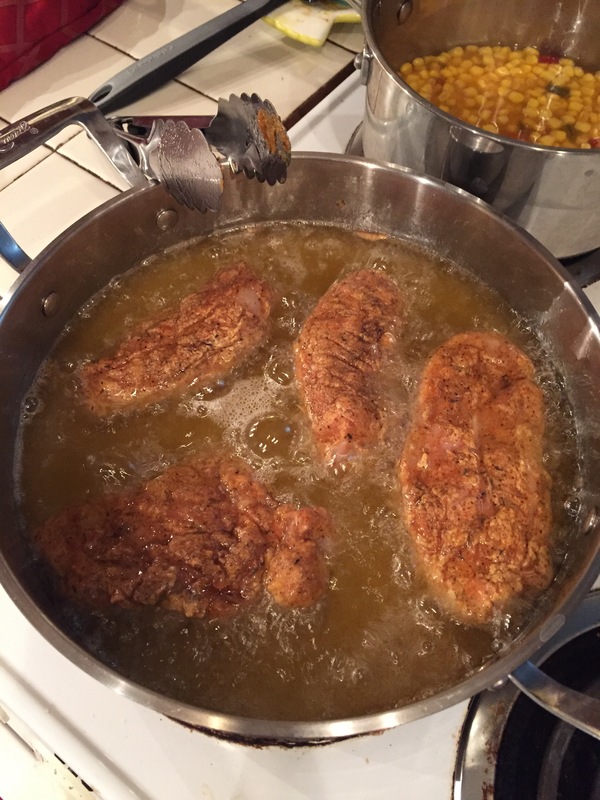 What’s great about the Double Crunch Honey Garlic Pork Chops recipe from Rock Recipes is that you make double the amount of needed breading and sauce. That got us thinking… what else could we bread and fry with this deliciousness? Chicken! 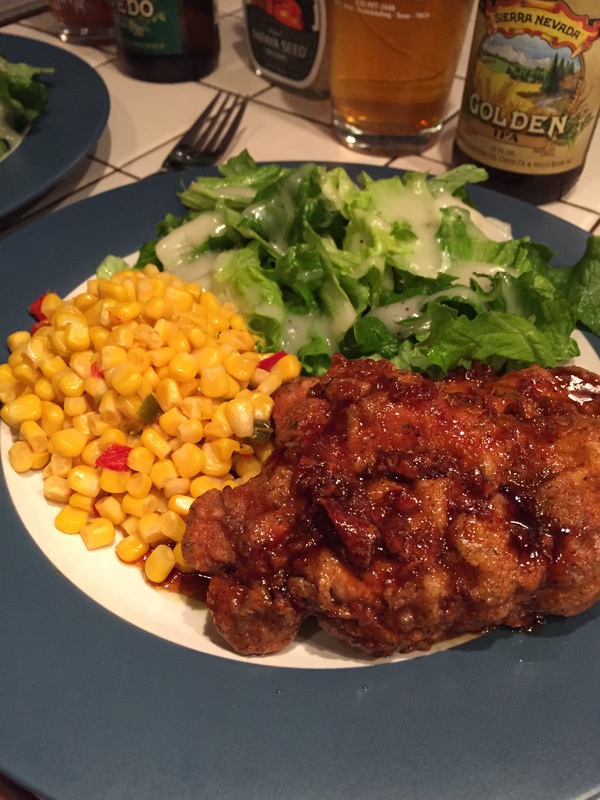 Over the next few days we’ll roll out our review of Chef and our Double Crunch Honey Garlic Chicken Drumsticks recipe, but let’s start with the pork! 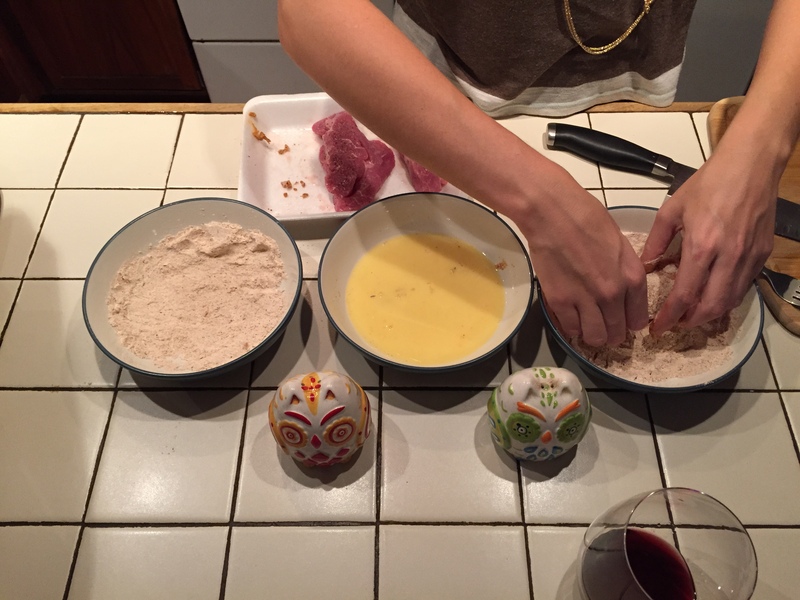 We found this recipe for pork a few months back when we wanted to try something different. This was my first attempt at frying… actually, truly frying. Now don’t get me wrong, when you’re working with hot oil it’s never easy per say, but I was surprised how easy it was. 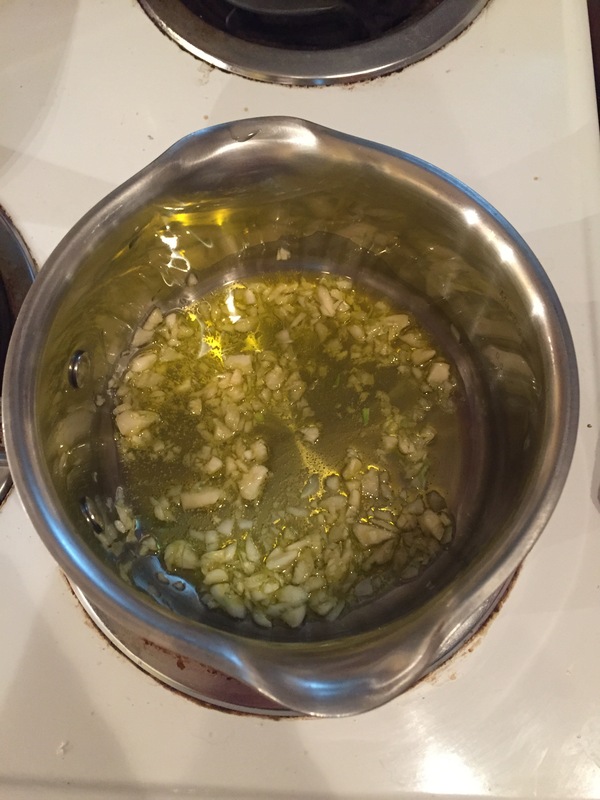 You use a TON of oil that gets very angry very fast, but once you get it going and stand back the magic just starts to happen. I started by making the sauce. This doesn’t have to be first, it all depends on your kitchen management skills. I like to get the sauce out of the way so it has time to sit and let the taste develop and so you aren’t having to worry about your pork being done before your sauce. 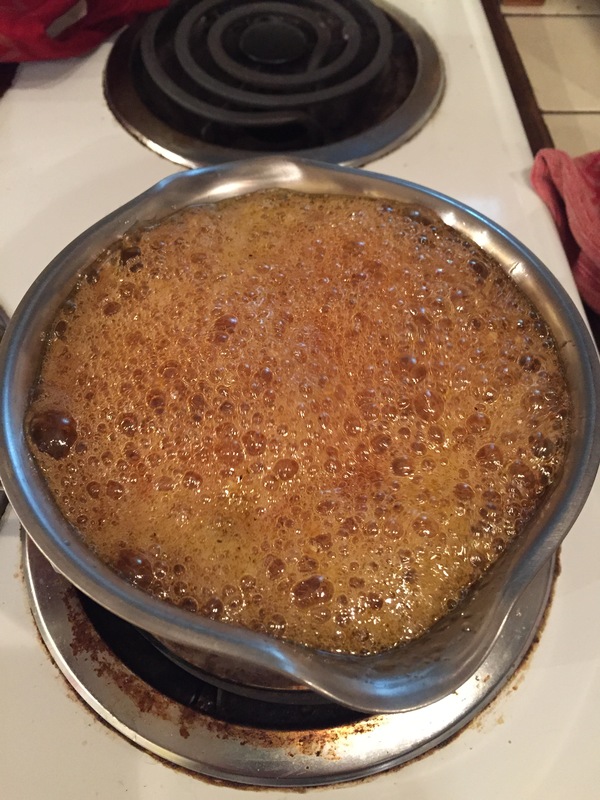 …and then add the rest of the ingredients to simmer. The recipe does warn that the sauce does foam. You want to keep an eye on it so you don’t end up with a mess on your stove. The best thing to do when it foams is briefly remove from heat and stir. Next make your breading. Look at all those pretty spices! Give that a mix and prep your dredging station. Because the recipe makes more breading than needed, divide up your breading based on what you anticipate using so you don’t contaminate the leftovers. 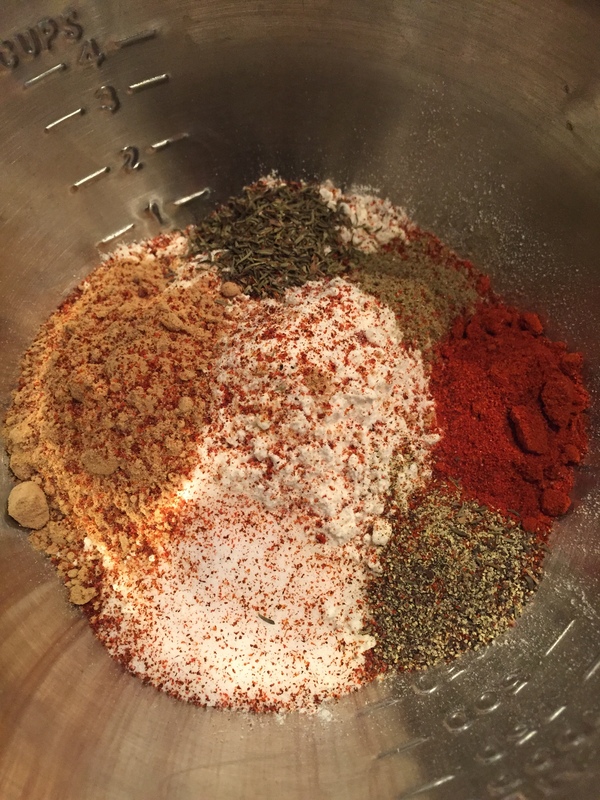 Put approximately 1/4 mix in one bowl and 1/4 in another. Better to add later than toss a bunch of unused mix. And yes, your station does include a nice cold beer and/or wine! 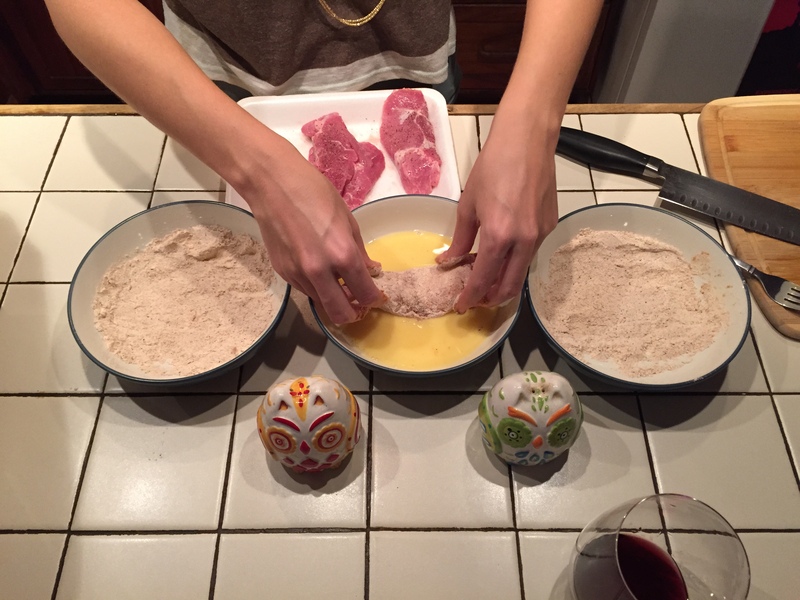 To prepare your pork, dip it in your flour mixture until covered. And here’s the key to the double crunch: coat your pork one more time in the flour mixture. 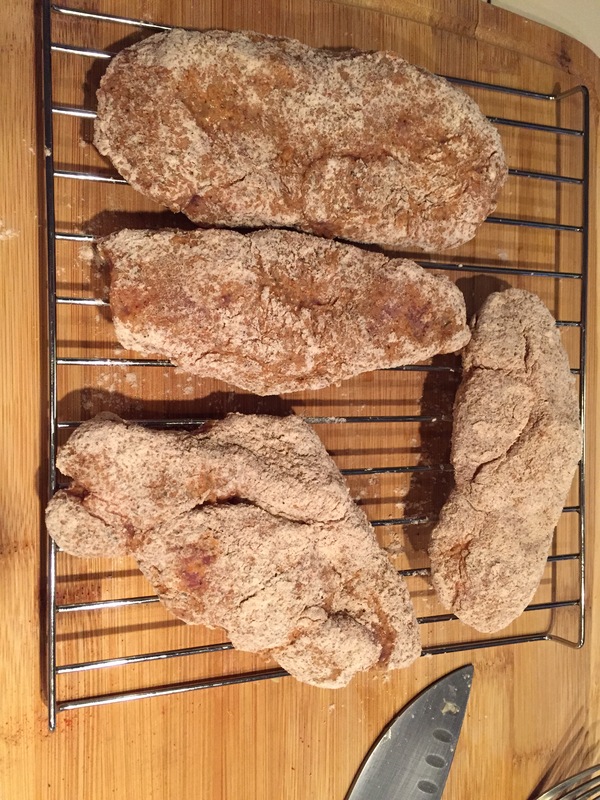 This insures that the pork has a thick breading and makes it extra crispy. Your pork should look about like this when you’re finished. Now it’s time to fry! 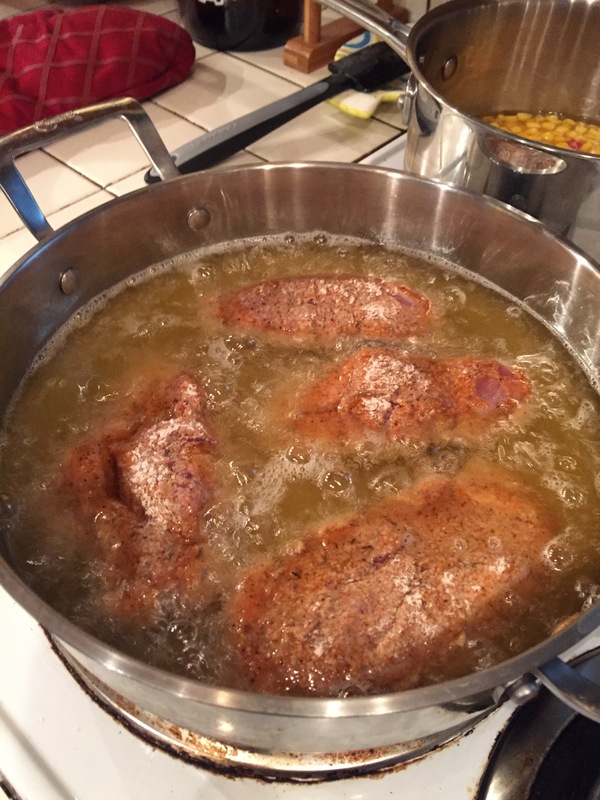 You want to use a lot of oil and be sure that it’s nice and hot and then carefully dip your pork to get it started. Keep a close eye on the pork, it will fry up quick and you don’t want it to burn. Flip it a few times according to the recipe directions until it’s ready. 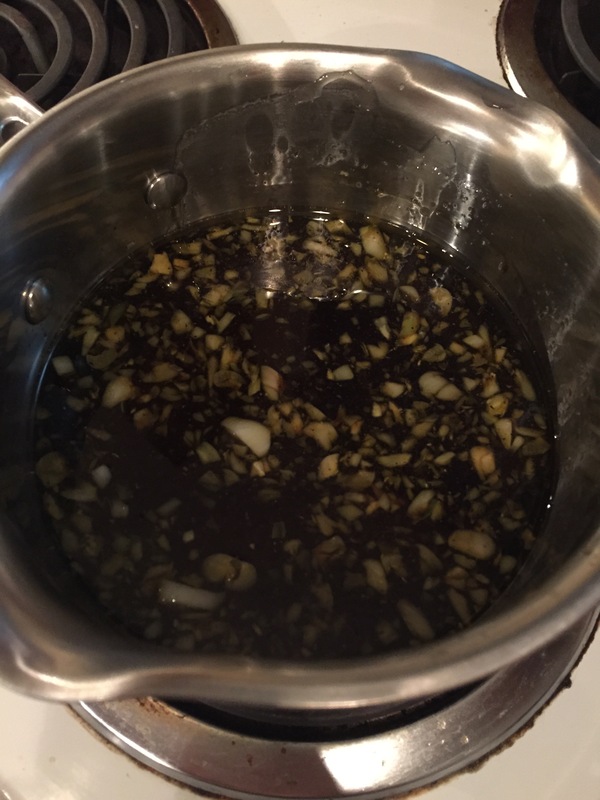 The recipe recommends that you then toss the chops in the honey garlic sauce. We let them sit out for a bit and then just poured the sauce on top. 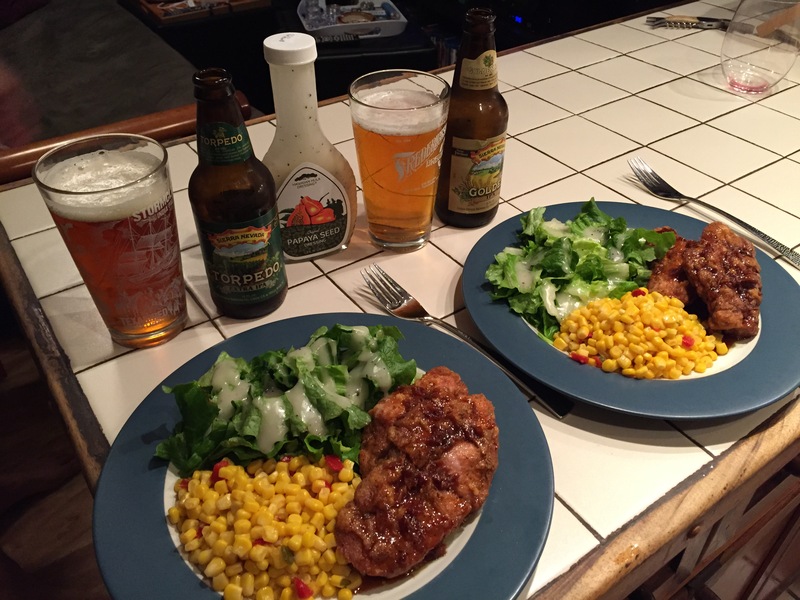 We served with southwestern corn and salad with papaya seed dressing. As we were digging in we thought… How amazing would it be if we did this with chicken?Our inspiration led to another tasty recipe, but that’s for Part 2. Up next, our review of Chef! 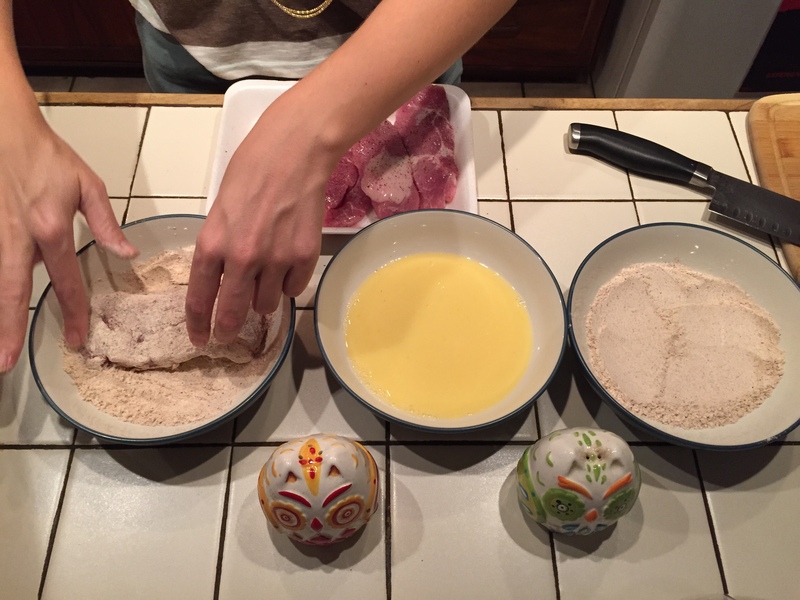 This entry was posted in Recipe and tagged Aspen, Food, Fried Food, Garlic, Honey, Pork, Recipe. Bookmark the permalink.